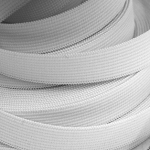 Knit Elastics are lighter than woven elastics but still strong enough to be used for waistbands, slipcovers, tire covers, etc. Can be used also to hold cushions in place on furniture and in a variety of apparel applications. 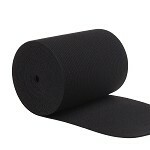 Available in 4 widths of black & 3 widths of white.